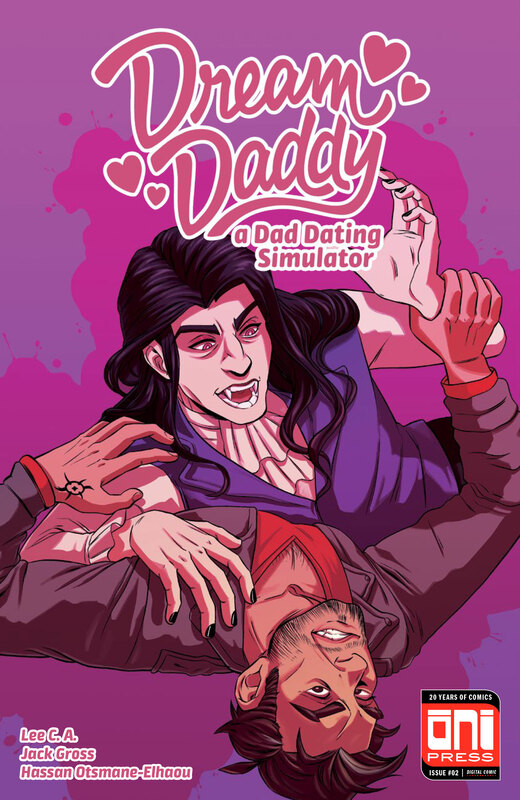 Dream Daddy #2 Review – AiPT! Hear that flutter of bat wings? Those howling wolves? There might be a vampire in Maple Bay! Or is it a…dad? Dream Daddy #2 takes place just as Damien Bloodmarch moves into Maple Bay and his pale skin, Victorian fashion, and general vampiric vibe don’t sit right with totally legit, definitely knows what he’s talking about, cryptozoologist Robert Small. The hunt is on, so does the issue deliver an entertaining game of dad and mouse? For the second issue in Oni Press’s video game adaptation comic, Lee C.A. writes a standalone issue that can be enjoyed by readers whether they have or haven’t played the game. C.A. brings all of Robert’s charming love of cryptids and horror to the script, making him lovable and almost goofy throughout the issue. There’s a sequence where Robert begins to imagine his evening as a German expressionist film that feels very on brand for the character. Robert has kind of a tough-guy attitude in the game until you get to know him and framing the issue from his perspective allows us to move past his prickly exterior immediately to get to his more sympathetic side. Damien’s voice is trickier to nail, given his penchant for Victorian mannerisms mixed with the exasperation of a father doing his best with a teenaged son. C.A. invokes Damien’s voice expertly, never making his Victorian interests into a shtick, but instead making them only one part of a nuanced character who’s all the more interesting because of it. Speaking of nuance, C.A. also nails his portrayal of Mary Christiansen, Robert’s friend and wife of local Cool Youth Minister Dad, Joseph. She’s irreverent, she’s witty, and just as she does in the game, she steals every scene she’s in, playing off Robert’s cool exterior with narrowed eyes and a good-natured, but barbed tongue. This issue is much more concerned with character antics than plot, so getting these voices right is a make or break game, but C.A. plays to win. Jack Gross handles the pencils, inks, and colors of the issue and manages to express a ton with relatively low detail. The overall tone of the book is pretty lighthearted, and the artwork conveys it well, emphasizing lively expressions and mood-perfect lighting over needlessly complicated linework. The sequence where Robert imagines the world as German expressionist film are my favorite in the issue thanks to Gross’s masterful depiction of the filmic mode. From the dramatic shadows creating a high contrast in the lighting to the tilted “camera angles” in the panel compositions making the architecture lean and tower over Robert, Gross plays the aesthetic straight, adding to the overall comedy of the sequence. There are a couple of panels in these pages that show Damien in profile, long black tresses flowing in the wind, and Robert looking on in trepidation immediately after that are frankly gorgeous and make me want a whole comic by Gross in this style. There’s plenty to love about the art outside of that filmic sequence as well. As I said, Gross’s work prioritizes expressive faces and there are lots of great close ups on Robert as he experiences all manner of fear, suspicion, and excitement. His overexaggerated reactions next to Damien’s debonair coolness show Gross can render a variety of dads to swoon over, though their attractive appearances never distract from the silly premise of the story. Hassan Otsmane-Elhaou’s lettering also keeps the issue on track, adding a red frame behind Robert’s narration boxes that matches the color of his shirt, making it clear whose story this is before he even appears. His font choices for the movie poster panel and the time and place boxes convey the expressionist and action movie genres respectively, making the lettering tie into the comedic bits of the issue nicely. Overall, Dream Daddy #2 gives us a deeper look into a couple of the game’s dads in a lighthearted story that anyone can pick up and enjoy. Fans of the game might spot more references or laugh a bit more at a couple jokes here and there, but anyone looking for a fun story with some loveable weirdos should give this issue a try! C.A., Gross, and Otsmane-Elhaou deliver a fun issue that nails the characters' voices and plays with genre through highly expressive artwork. C.A. nails all the character's voices, making them all feel multifaceted and likable. The issue can be enjoyed by any reader, regardless of whether or not they've played the game. Gross's artwork emphasizes lively expressions and dramatic lighting that expertly convey the mood. Otsmane-Elhaou's lettering adds to the comedic bits nicely.